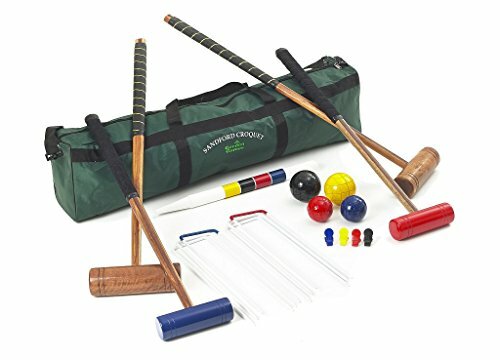 The Garden Games Sandford Croquet Set is an excellent value croquet set designed specifically for families. Comprising 2 adult mallets, 2 smaller mallets for children and all the necessary croquet accessories, the Sandford set is packed in a convenient carry bag for easy transportation and storage. packed in a canvas bag with carry handles and shoulder strap. Note that the balls are painted wood - like the old traditional balls. With all wooden croquet balls, due to the nature of the game, the paint will deteriorate over time and probably from first use.